Our Spring 2019 professional development (PD) calendar is now online. Browse our offerings, and register for a series that aligns with your PD goals. Our offerings include a wide range of high-quality professional development opportunities for all early learning professionals — administrators, teachers, teacher assistants, and family child care providers. Classes begin on April 18th. Before you register, please check the dates to make sure you can commit to attending all of the sessions. Each individual may register for no more than two series each semester, so choose carefully! Spotlight on Science: Using Library and Local Community Resources in Early Childhood Settings — A new series for family child care providers! Supporting Teachers’ Professional Development — A new series for education coordinators! Three offerings on the Classroom Assessment Scoring System® (CLASS) — We have series for administrators, classroom teachers, and family child care providers. 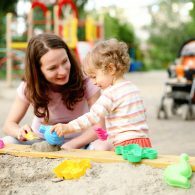 Developing a Standard of Care for Your Outdoor Space — Learn about the important role that child care facilities play in overall program quality. Center Staff Enjoy Day of Service!